Gmail is an email service provided by Google Inc which is the most widely used email service around the world. About three of four people use Gmail as their primary email Id for email communication for individual purpose. Another email service provider which is equally popular like Gmail in outlook. Outlook is an email service provided by Microsoft which was earlier known as hotmail. Since its acquisition by Microsoft, outlook has come a long way. Outlook is not only used as an email service but a platform where you can use different email accounts to easily read and send emails from different accounts. One such facility provided by Outlook is to use Gmail account in Outlook to send and receive emails via your Gmail ID. Step 1) For the starters, one must have a valid Gmail account as well as an Outlook account. 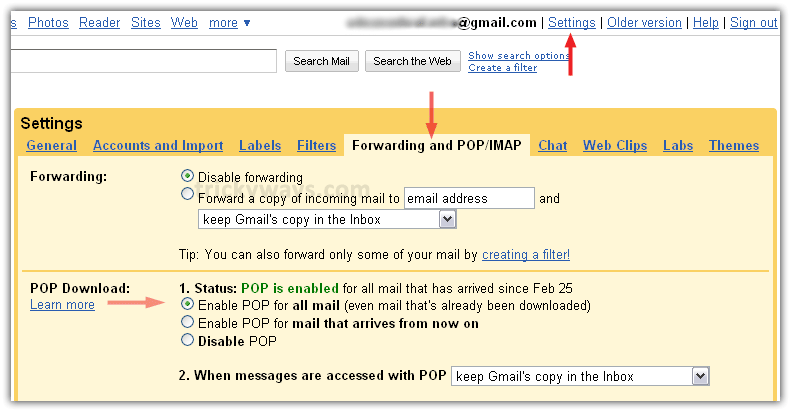 If you want to configure Gmail on Outlook, first you need to enable IMAP setting in your Gmail account. To do that, you need to log on to Gmail and go to settings. Here you need to enable the IMAP settings. Step 2)Now you can proceed to configure Gmail account on Outlook. For that, Go to Outlook and then from the File option choose Account Settings. Here click on New and then click on Email Account. Step 3) Choose the type of Setup as Manual and then on Add Account page, enter the information of your Gmail account. Enter the password and choose a name for the account. The name can be any name you like. Put Account type as IMAP and incoming mail server as imap.gmail.com. Your Gmail will be configured for incoming emails. Step 4) For outgoing mail settings, enter outgoing server name as smtp.gmail.com. Enter port number and click on Save. Now your Gmail will be completely configured for both incoming and outgoing emails. You need to test your connection by sending an email to your Gmail account. If the configuration is successful, you can enjoy using Gmail on Outlook platform. In case you face any problem while configuring Gmail on outlook, you can reach out to Gmail team for any queries. Your queries will be solved within a short time frame by Gmail support staff. · First of all, sign in to your Gmail account and then click on the Settings. · Go to the Forwarding and POP/IMAP section and then enable IMAP from the drop-down menu. · After that, click on the Save Changes tab. · Now open Outlook and then click on Tools. · Click on the Account Settings and choose New. · Choose Manually Configure Server Settings option. · Now click on the Internet Email and then click on Next. · In this step, enter your name, email id and password into the given field. · Choose Use same settings as my incoming server. · After that, click on the OK to finish the process. If you are facing any technical problem while configuring your Gmail account in Outlook from the above given steps, then get help from the highly skilled professionals. These professionals will provide better solutions to configure Gmail in Outlook. You can easily get this support by making a voice call. This support is accessible at 24/7 hours across the globe.